Yuba Reservoir is quickly becoming the place to catch some of the biggest fish in Utah. On March 5, biologists with the Division of Wildlife Resources caught and released a 21½-pound Northern pike in the shallows at Yuba. DWR Aquatic Biologist Don Wiley says biologists set nets during the week of March 5 to capture Northern pike as they moved into the shallows to spawn. The nets were set close to shore, in about three to eight feet of water. "The first fish we pulled in and released was a 21-and-a-half-pound female Northern pike," Wiley says. "This is the largest pike I've seen come out of Yuba." 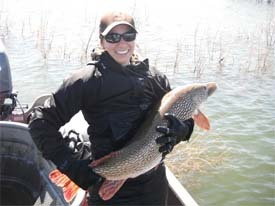 Biologists are collecting some of the northern pike (mostly males) to make sure the pike are free of disease. If the pike are free of disease, biologists will collect eggs from the females. The eggs will be used to help raise tiger muskies at the DWR's Lee Kay Warm Water Hatchery Ponds in Salt Lake City. Tiger muskie are a cross between a muskie and a Northern pike. Yuba Reservoir is just off Interstate 15 in central Utah, about 30 miles south of Nephi. During March and April, you can often find Northern pike cruising the shoreline in shallow water, looking for a place to spawn. To catch Northern pike at Yuba in the spring, target the shore line and fish in water three to 10 feet deep. Northern pike key in on shoreline areas that have lots of vegetation. They especially like to spawn in areas that have tamarisk. "Avid Northern pike anglers know it's a good time of year to target these large, toothy fish," says Scott Root, regional conservation outreach manager for the DWR. Root says casting crank baits that imitate fish is an effective way to catch Northern pike. "But remember that catching a pike usually requires a lot of patience and a lot casts," he says. You can stay updated about fishing success at Yuba by reading the Central Region fishing report at the DWR's hotspots fishing Web page. The page is available at www.wildlife.utah.gov/hotspots.